After six years, Dinings has become one of the best Japanese restaurants in town, combining bold modern flavours with traditional techniques and ingredients. 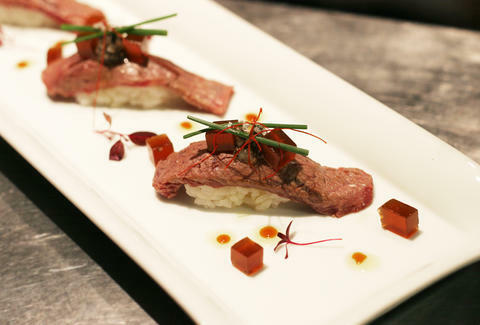 These are bites that will leave your tongue wagging for months after, especially the seared Wagyu beef sushi topped with truffle salsa & ponzu jelly. Considering this culinary adventure comes from the talents of Nubu alums Masaki Sugisaki and Keiji Fuku, the consistent level of near-perfection should really come as no surprise. 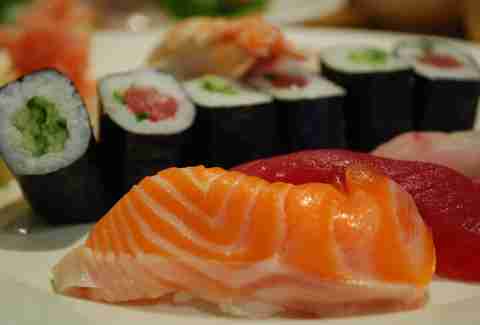 When it comes to sushi, it’s all about finding the freshest, best quality fish. Atari-Ya has done away with the middle man by doubling up as a fish supplier, meaning you can be that much closer to the source. Sure the decor isn’t anything to write home about, but you’ll be too busy throwing back rare delicacies like botan ebi, engawa, and natto. Word to the wise: be sure to book on the early side as it frequently sells out. Growing little sister to powerhouse Zuma, Roka is pretty fantastic in its own right. 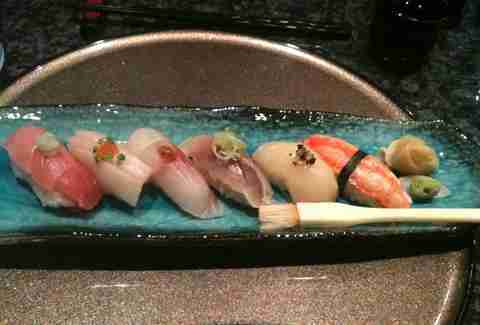 While its focus is its robata grill, the sushi is still some of the top in town. It’s a pretty slick operation here with a high concentration of tables (so, not one for an intimate meal), but the dishes will make you forgive that. The tasting menu, while not super kind on the wallet, is a great way to see the best Roka has to offer, with sushi in the spotlight plus its outstanding black cod and Wagyu beef. First opened in 1997, this was Nobu’s first outpost beyond the US, which quickly won over London, grabbing a Michelin in its first year and becoming one of the toughest reservations in the city. 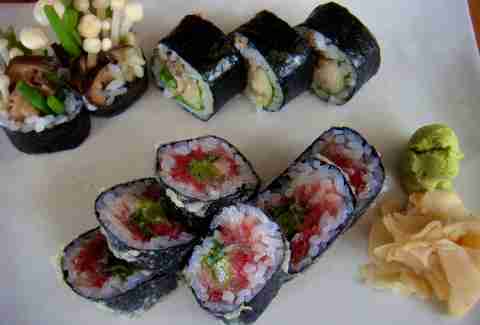 With a South American influence (but not enough to call it fusion), this is sushi like you’ve never had it before. Both locations feel a little stark, but the service is top-notch, and the food superb, with many alumni going on to open their own spots with waiting lists just as long. Stepping into this tiny 12-seater tucked down a backstreet in Bayswater feels like a quick journey straight to Japan. 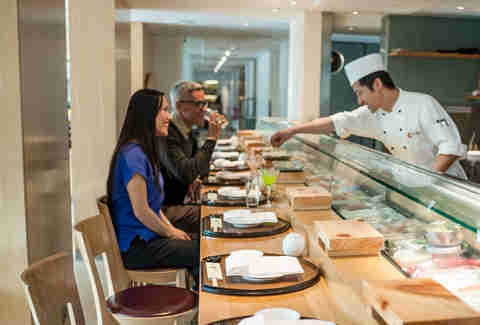 Go here for a full experience, complete with wood and paper screens, hushed background music, and the charming husband & wife team that previously used to have Sushi of Shiori in Euston. It only has tasting menus, which can take several hours, but trust us, you won't be complaining. With only seven seats and booking lines that open only twice a month, getting a perch here is akin to finding the holy grail of sushi. 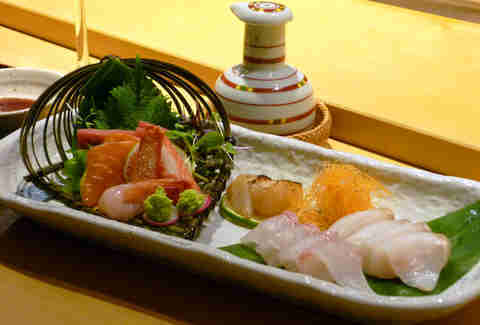 But have patience, and you can have some of the most authentic fresh fish outside of Japan. Wizard-like Head Chef Toru Takahashi -- nicknamed “Tetsu" when he was a young apprentice in Kobe -- hand-makes everything, so put your mouth in his hands, and you won't regret it. Sit at the bar under the neon sign readying “Without Soy Sauce,” and get involved with more flavours than a sushi bar ought reasonably to have. 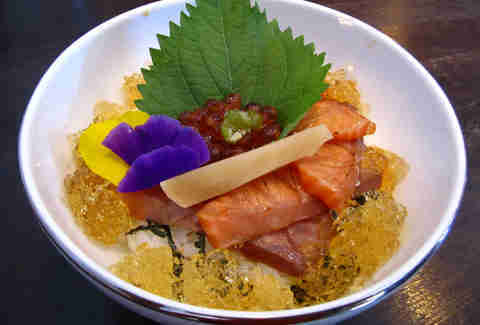 Each dish is liberally seasoned with umami, small dabs of paste, jelly, and special sauces, giving it a very different experience than you might previously associate with sushi. It’s really all about the details here, so open your eyes -- and mouth -- and take it all in.